Mark Walters was in hotel TIA before the match on Saturday. I picked his book up. Looking forward to reading it now. Remember his Auxerre goal well from 91/92. Good interview with him on the red blood podcast as well. There seems to be an awful lot of Liverpool fans that are loving his supposed errors. As far as I'm concerned he done his best, it wasn't good enough and we have replaced him with someone better. I hope things go well for him. mushypea, edcarroll02, STEVE1978 and 4 others like this. Amazon are releasing a Steven Gerrard documentary in 2 weeks called Make Us Dream. Klopp has decided to leave Shaqiri at home for the game v Red Star.Keita travels. Anyone any advice on the LFC membership? Thinking of joining for me and my son. Any help is gratefully appreciated. Are you looking to hopefully get some tickets? Yes, my son is desperate to go. Well tickets for all the games in the 2nd half of the season will be going on sale very soon, as a new member you'll only qualify to buy for a few of those games but you'll have just as good a chance as anyone else in those members' sales. If they get a home draw in the fa cup that would be a more realistic game to aim for, premier league home tickets have become very hard to get. Cheers Superfan, appreciate the advice. I have found the premier league more difficult to get. I used to live in the city and with a scouse wife i would be over every other year for the last 20 years or so. Would have been to a game most Christmases we were over and at another times but haven't been in a while. Will get cracking on the membership. Thanks again. The club has local sales now, if you have access to a Liverpool address that might be the best road to go down. Thanks again Superfan. I’ll get on it tomorrow and check with the in laws. I know the father in law used to get tickets but not sure how. vodkacolly and honald_tdb like this. 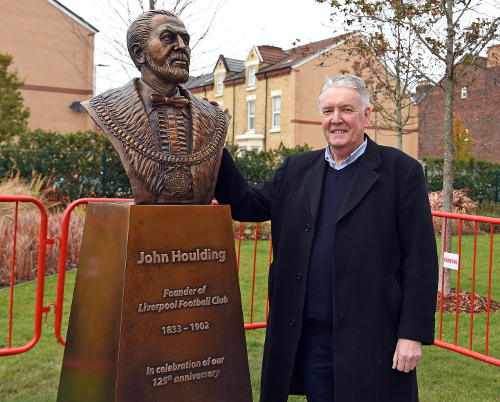 A bronze bust of Liverpool Football Club's founder, John Houlding, has been installed at Anfield. Reds fans will be able to see the statue, which depicts Houlding in his mayoral attire, on 96 Avenue from Friday November 9. The bronze, which stands just under seven feet tall, was created by Liverpool sculptor Tom Murphy, who also created the world-famous statue honouring Bill Shankly which sits outside the Kop and has become a landmark in its own right. The creation of Houlding’s memorial began as part of the club’s 125th anniversary celebrations last season and has been in development for almost 12 months. “We didn’t have any symbol at Anfield that was a representation of our founder that our supporters could see and touch and reflect upon,” said LFC’s chief executive officer, Peter Moore. “The project of creating the bronze began in our 125th season; 125 years is a long time and it was all started by this man – without him, football on Merseyside certainly wouldn’t be what it is today. Houlding officially formed Liverpool Football Club on June 3, 1892 following a dispute with Everton, who played at Anfield, the ground he owned. Everton left and Houlding recruited new players to make a team to play at his ground – and LFC was born. Houlding was not only the founder of the Reds, he was a businessman and Lord Mayor of Liverpool from 1897 to 1898. He died in the south of France in 1902 after a lengthy illness. “There are very few pictures of John Houlding in existence so I did a lot of research around the style of dress that would have been worn at the time,” said Murphy. An official unveiling ceremony will be held in the near future. mushypea, ROCCO, Joedared and 3 others like this. Got sorted with the Membership for me and the cub. Thanks for all the advice Superfan. Really appreciate it. Nice one, hopefully you have a bit of luck on Friday week. So I think I heard the nbc commentator say we have the second longest unbeaten home record on Europe’s too 5 leagues after Barca, who were of course beaten today. Anyone confirm that?